5.5 What is a train table set? 5.6 Why should I buy a train table set? 5.7 How do I pick the right train table set? Train tables offer an opportunity for your kids to have fun while learning and sharpening their motor skills as well as enhancing their creativity. They offer a good opportunity for kids to learn new things and figure out how different things work. Having the best train table will ensure that the kids actively engage their young minds while creating healthy levels of excitement and activity for their developing brains. Dismantling their toys and any other items that come their way is also part of their learning process as they try to figure out what is inside of these toys and other objects that they come across. This curiosity is very healthy but sometimes can be very expensive if it results in a lot of damaged items around the house as well as misplaced parts. Train tables play an important role in learning play as they provide a stable surface where the kids can place their train sets off the ground where they risk being accidentally trampled. Some train tables come with storage spaces which enable the kids to put away their sets or pieces that are not in use to avoid loss or damage. Some train tables also have landscape designs that complement the the train sets giving a more realistic feel to play time. The Brio Play Table is designed to be used by children ages three and older. The Brio Play Table is a simple and durable table constructed of solid wood making it very sturdy. This table is also very easy to assemble and take apart when needed. The design of the table makes it easy for children to access their trains from all angles. The top of the play table is decorated with land and water images as a backdrop for train sets, give an authentic feel to playtime. The table is sanded smooth with rounded corners and is finished with multiple coats of non-toxic paint for a chip resistant, vibrant finish. 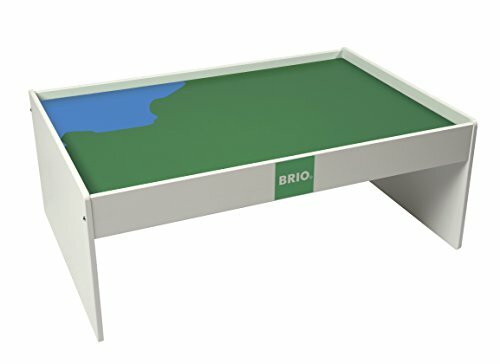 The Brio Train Table is available at Amazon.com for about $200.00 with free shipping. Made from solid wood making it durable. Finished with non-toxic lacquer paint that makes it chip resistant. 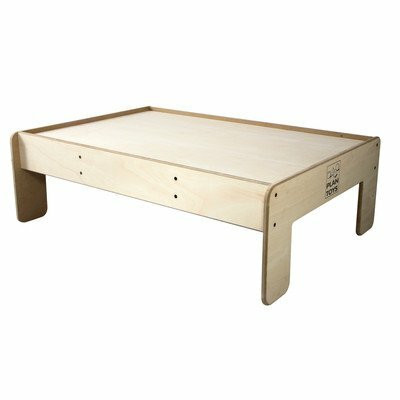 This table represents good value as it is made of solid wood making it durable and is designed in a way that the kids can easily reach their train sets without much difficulty. The initial investment is by no means small but looking at the bigger picture your kids will be able to use it for a long time. 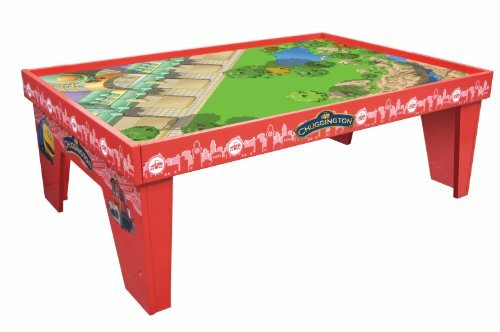 The Kidkraft Train Table is a kid-sized table designed to provide a sturdy surface where kids can place their train sets and enjoy playtime while keeping their trains off the floor. 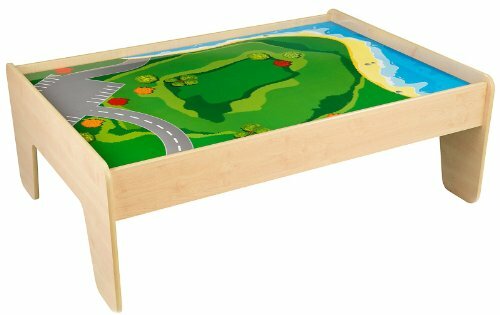 This table is wide and features T-molded edges to prevent chipping, curved edges for safety, a silk-screened landscaped table top, and a one-inch lip to keep toys from falling off the table edges. 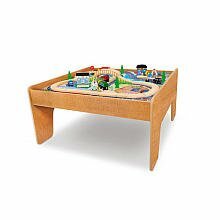 The KidKraft Train Table is available at Amazon.com for about $160.00 with free shipping. The table is easy to assemble and sturdy in construction. The table is constructed of pressed wood. Overall this is a good budget train table and offers a large enough space for the kids to build the train sets and gives them a good storage area for their accessories and other toys. This would be a good buy. This train table comes with an included 55 pieces that complete a train set. Given its price, it is a train table ideal for starters or for parents who want to set their an amazing train journey for their toddlers as it is a complete package that is ready to play train table set right out of the box. The table is also built with such reliable sturdiness and durability. It can be set both indoors and outdoors as it can withstand certain outdoor weather conditions. The train set and table are intended to open up your children’s mind to a fun and interactive play style. This could heavily inspire young minds to learn discreetly while simultaneously have fun. It is made from high quality, hard and durable wood. The train table includes train pieces and accessories which makes it ideal for beginners or starters. It enhances a certain set of skills and promotes an interactive and imaginative role-playing game. Each train pieces is made of durable and non-toxic plastic. The train-piece that adds to the total price as it is included is unnecessary. It is a train set with no motor, engine or not powered by electric or battery wherein sooner or later, your kids will get bored of those train pieces and will require you to get a new train set. The train table has no storage, drawer or bins included for those train pieces included. This is in general, a great train table as with its moderate or mediocre price, you can give your child a complete, ready to play set. The table will also last for a long time as it is crafted with great skills using high-quality wood. The nicest thing about KidKraft table is the overall appearance of how it is constructed. It looks simple but very sharp, neat, elegant and with great aesthetics. Most of their train tables are built with an elevated edge or have curved edges for safety purposes. The elevated edge acts as a wall to keep all your children’s things, play tools and accessories secured on top of the table. The curved edges will keep your children safe in case of bumps or falls during their play. Not like with most train tables with a pointy edge that could cut or injure your children during accidents. This train table is built with finesse, class and reliable construction. It uses high-quality wood, non-toxic paint screws that could hold a pressure and weight. The surface is with great proportion which gives your train set stability. The train pieces and toys do not tip off or derail. This amazing train table comes with 30 pieces train set made of strong and durable plastic. Non-Toxic. All corners have curved edges for safety measurement. The overall dimension of the train table measures to about 25 by 23 by 16 inches. It also comes with a free activity table with 2 sides of different designs to where you can set-up your train. This train table is large enough to cater 2 to 4 children. It offers a nice space to cater to your children or your kid’s friends. It requires minimal assembly and comes with a detailed instruction manual. It does come with free train pieces and accessories but no storage bins, cans or drawers to where you can place it all in one side. The train set is non-motorized. It is only made of plastic where growing kids will get bored easily. In addition, the train set is non-essential for people who only look for a train table or with an existing train set. The train set is not free and is added to the overall price of the table. 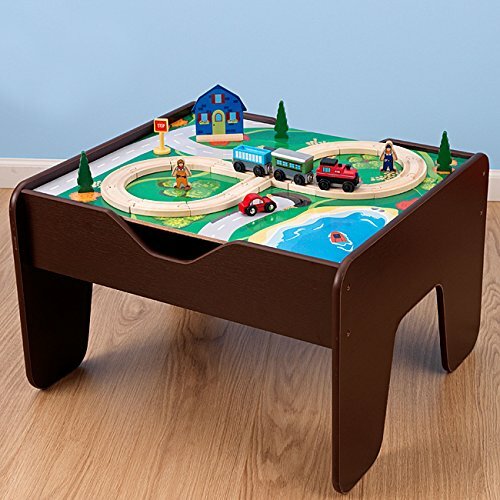 This is one of the best-selling train tables of KidKraft. It is reliably strong and durable. The train table has a nice non-toxic paint color. It guarantees a long and fun play-time for your children and could also work as an activity table and not just for trains. This set is an eye-catcher. Their train car features many tantalizing colors providing the youth with a real-life environment alike. Natural details such as bridge, lakes, mountains, and runways are coated with melamine. Train cars are almost compatible with other train sets. It can easily be replaced if you lost or anytime you feel like it. The table is wide enough to cater to your train set. It can stand up to 16 inches high enabling your children to interact with the set well. The table set measures 49 inches long and 34 inches wide. It has a nice T-molded edge that provides your kids a smooth and safe surface. It also prevents it from chipping off. The complete set takes only about 15 to 20 minutes to assemble. A table can hold a kid standing on it. It simply shows how sturdy the table is made. It includes many carts and mobile figure accessories. The set comes with two train cars and a train engine. It also has an airport which includes an airplane and a helicopter. The set is highly detailed with lifelike environment good for the kids. Some parts of the sets tend to derail or fall out of the track. The train tracks don’t hold well making the trains stuck. In some cases, some support beams of the table don’t have screw holes. One of the things we could hope for in a train table is something where we can place our children’s play-set and accessories. It is something that could help in the organization of things and promote a non-stressful, scatter-free play environment. It could also help in avoiding losing or misplacing things. This train table is very large and spacious. The table set includes 3 pieces or large red, non-toxic, plastic bins to keep your children’s things organized. This table is ideal for accommodating several kids as they play, given the size and dimension of the table. It has a silk-screen play-board on top to where you train set will have a nice green, mountain, bridge, and city setting. The table is built with great construction. It can carry a certain amount of weight from children leaning on and the train set. In addition to its construction, as the most KidKraft table, safety is a priority. The edges on all corners are curved and not at all pointed. This is to avoid any injuries in case an accident occurs, especially when your child falls or bumps the corners of the table. The table is made with an elevated or T-molding edge to keep all the things on top of the table and avoid chipping. The total dimension of the table measures to about 48.75 inches in length, 34.38 inches in width and 16 inches in height. It has a built-in landscaped play-board on top. The table is ready to be used for different train sets. This comes with 3 pieces of durable plastic bins that are fairly large and is made from non-toxic plastic materials. The table may look to have been built with thin pieces of wood but it actually has reliable durability and sturdy construction. It will last longer than with most tables and can easily handle children’s rough play or beating. It includes a train set and a track. This is actually ready to play train table and set with storage bins, ideal or perfect for toddlers or younger kids to start their amazing train experience. The laminated board or tabletop tends to peel off after a few months of using or playing with the table. It compatibility of the board and the train tracks included are limited only to a few types of train sets. This is a slightly expensive train table with a ready-to-use train set but could greatly give your children long hours of fun and entertainment. It requires minimal assembly effort and can actually enhance your children’s set of skill during connecting and assembling. It is a lovely train table and train set to have for a reasonable price. 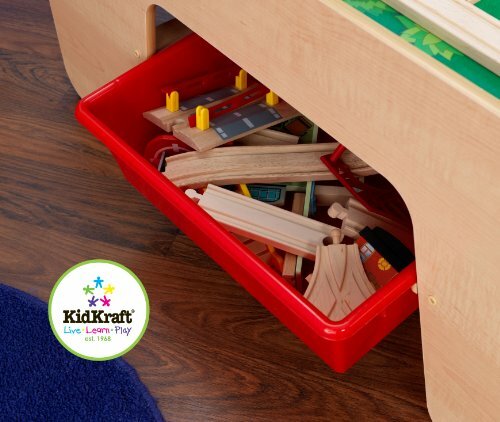 This is another great train table with storage bins from KidKraft. It is one of the popular KidKraft table and train set in the market. This is intended to where you lay out your train set but this table can also work great for and learning activity for kids. This can open up your children’s creativity and imagination. It promotes a healthy and fun, interactive play style. The table is guaranteed to provide your children with long hours of imaginative role-playing. It has a size built for your child but enough to also accommodate his or her siblings or friends as it is fairly large and spacious. The table set includes train accessories and important train pieces, all of which are made from durable plastic with bright and vibrant colors. The set will require your children some assembly but the fun starts upon the puzzle of connecting each piece. With minimal supervision, your kids will discretely enhance their set of skills such as logical and hand-eye coordination as they assemble the set. The table includes 120 pieces of fun and durable playset. It is divided between train tracks, train cars, infrastructure, trucks, cars, and figures. It has a built-in, surface table play-board with a flowery green setting, perfect for the included train set and any other train set. This set can bring out the engineering side of your children. It will enhance their creativity and imagination as they try to build their play town or city with train tracks set out all across the play-board. The table comes with a nice, 3 pieces red, durable and non-toxic plastic bins that are perfect for storing all the train pieces included and other kinds of learning play-set your kids have. It is built with strong and sturdy construction. The screws fit nicely on each table holes and can support the weight of the play-set on top and the weight of your children as they lean on the table. The train cars and train engine car are not built to have any motors installed. Your child needs to push it around the tracks in order for it to run through. The table is by far great and unquestionable but the train set and pieces included adds to the total price which makes it unnecessary for people who just want to purchase the table and not the set. Assessing in general, the train table itself is fascinating and will definitely give you the right worth for your money or even more. The train set, somehow is ideal for toddlers and for young kids but sooner or later, the kids will get bored of it and will demand a new set to be laid out, especially a train toy set running on motors. This nice square and large activity table are made and brought to you by Maxim. The table comes in 45 pieces of train tracks, train set, and accessories. A nice thing about this set is that the tracks are compatible with the well-known train sets, Thomas and Friends and Chuggington train sets. It is made of simple but strong construction. Maxim used a nice quality of durable wood to build this, slightly tall and spacious train table. The train table with its freebies of train set and accessories amazingly comes at an affordable and reasonable price. The set also includes one, but large storage bin to where you can place all those train pieces and organize them properly. The train set is with great versatility. Its tracks and other accessories can be used for both Thomas and Chuggington train sets. Maxim uses durable wood that does not break, wear or tear easily. The table includes a detailed design play-board on top or on the surface. The train pieces (45 pieces) come in a large blue-colored storage bin and provide great organization. It can withstand the weight and certain conditions. The table can be set if your children or kid wants to play outside or indoors. The table is made of thin wood. Failing to supervise a good play environment, your children might have the weight and strength to break the train table. It includes 45 pieces that form your train set but does not have remarkable details and are also made of thin plastic. The train table is ideal for toddlers and younger kids. It is affordable and easy to assemble, making it perfect for beginners or for people who have the need to rashly purchase a train set and table for their kids. The Melissa & Doug Deluxe Wooden Multi-Activity Table is an all-purpose play station that is designed for use by children ages three and older. The table features a double-sided play board as well as a built-in drawer for convenient storage of train sets and accessories. This activity table is ideal for trains, blocks, puzzles and other kids’ activities. This table is easy to assemble and has a large surface area. 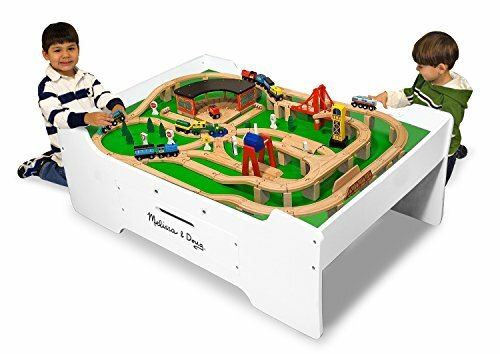 The play table is 16 inches tall and is conveniently sized for young children, making it easy for them to play with trains on the table while either kneeling or sitting on the floor. The Melissa & Doug Deluxe Wooden Multi-Activity Table is available at Amazon.com for Prime members for about $110.00 with free shipping. Large and sturdy wooden table. Has a large storage area. 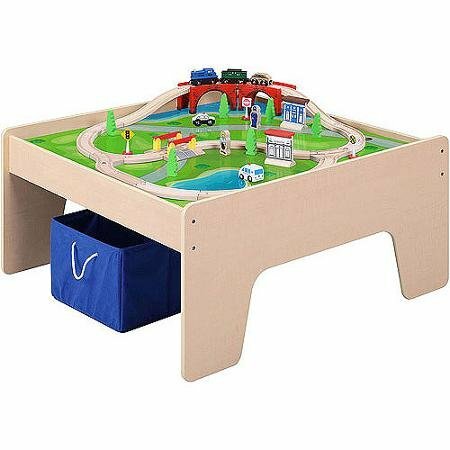 This train table offers a quality play surface as well as a large enough storage area where the kids can store their toys as well as train accessories to avoid lost pieces. The price is also budget-friendly making this a good buy. 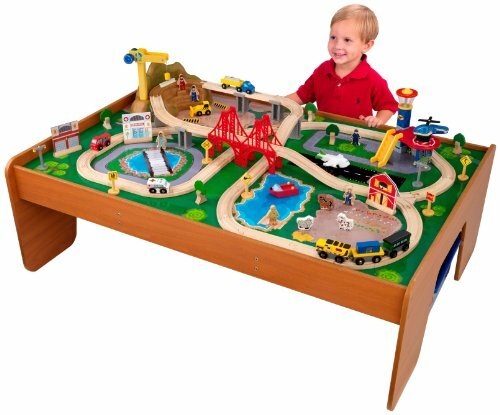 This is the KidKraft Metropolis Train Table. This is one of the largest sized train tables with train sets in the market. The table is elegantly designed and painted with a perfect finish. It has an average or mediocre price but of a top-notch quality table. You’d see that the table is neatly crafted with a laminated play-board on top. The play-board along with the train pieces included has a high-grade detail. On the other hand, this is not like with the previous KidKraft table who uses bins as a means of storage. It has underneath it, a built-rolling trundle or drawer. The downside of this would be its table top. The top of the surface of the table has non-elevated and not at all, curved edges. The greatness of this set does not only end or focus on the table. Each included pieces of train pieces and accessories are all with great detail and are loaded with fun and interactive features. The table is coated with a fine and high quality, espresso finish. KidKraft uses a fine and solid wood frame that could withstand a rough beating of a child. Train pieces count to up to 100 pieces and include a tier two bridge. The train table and set, all 100 pieces of it, laminated play-board, storage drawer, etc. are all of a great and affordable price. This can also be used for any learning activity. The edges of the table are not at all curved. It can cause injuries in case of any accidents. Table surface or table top has no elevated edges. Train parts or pieces that always tip off the ground and scatter into places of the room. The added drawer is actually of a larger scale. 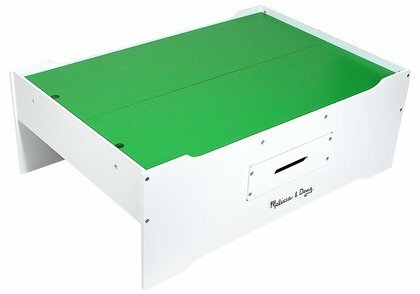 It replaces 3 pieces of storage bins into one storage drawer. It makes organizing more neat and pleasing. The drawers of the table are usually dependent on the dimensions of the table itself. The larger the table, the more storage capacity the drawer has. This is considered to be one of KidKraft’s Best train tables. The size is totally amazing. A table size is the biggest factor that makes a table set fun. The large space given to you by a large table can trigger an imaginative and creative play as children will have the tendency to innovate in order for them the consume the space provided. A smaller size or a table with lower dimension will limit your children’s imagination in building and assembling their train sets. This amazing, limited edition, train table on a waterfall-mountain setting is a wonderful train table for you and your kids. It has a built-in drawer underneath, enough to store all of 120 pieces of train set and accessories. It totally saves you the trouble of looking for a large bin to be placed underneath and to act as a storage unit. It has a total of two mediocre size drawers. One on each side. This is actually a must-have train table as it is only limited. It comes with a manual with great details on how to connect each table and train set pieces requiring you and your kids, minimal effort in assembling. This table is made of sturdy construction and uses high-grade quality wood. The table has a total dimension of about 48 inches in length, 32.7 inches in width and 15.7 inches in height which makes it fairly large and tall compared to other train tables. It is compatible with wooden Brio and Thomas and Friends train sets. Expensive as it includes a train set. It does not give you an option to only buy the train table. Coated with a nice silky finish but uses a non-attractive color. If you are looking for the best train table that has it all, from storage, safety, and security, sturdiness and loads of fun train pieces, then this limited edition, Waterfall-Mountain, KidKraft Train Table is the most appropriate for you. It is an all-in-one train table and train set. 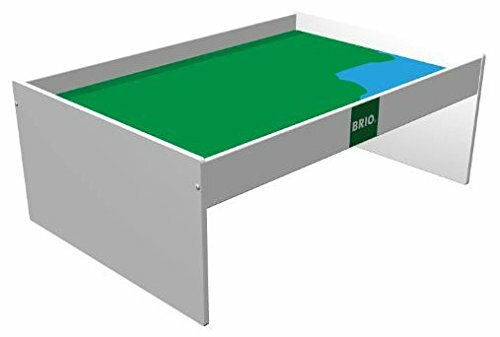 There are numerous train tables available on the market but the Brio Play Table stands out based on the quality of the materials used and the advantage of solid wood construction. The cost of this train table is slightly on the higher side but the quality of this table guarantees you durability making this a good long-term investment. If you are restricted in terms of your budget then the Melissa & Doug Deluxe Wooden Multi-Activity Table is a good alternative though there is a notable difference in quality as compared to the Brio. However, the table still serves it purpose and saves you quite a bit of money. 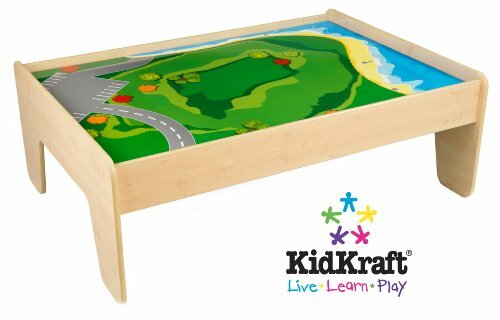 If you are looking for a less expensive table than the Brio, but still want the landscape image on the table top, the KidKraft Train Table is a good option. First and foremost, you need to take into account the sturdiness and the durability with which the table is made of. The intention of the purchase is to cater to young minds or children and as we all know, children can sometimes play rough with their play-set. The possibility when you fail to give supervision during their play of them stepping or standing on the table is more likely to occur and a table with a small sense of sturdiness or durability will leave you with a broken play-set. Adding more to the weight being pressed down, a good or best train set table must be able to accommodate the train set made of heavy and strong materials, adding more to that, few children might gather around the play-set and lean on the table as the train goes around or as they play. Another thing you need to think of is the size. If you have only 1 or two kids, then an average or mediocre size can do the trick as they both can enjoy the tablespace on each side. However, if your kids have the usual habit of inviting friends or neighbor kids over to play with them, you might want to have a large or full-scale train table to cater to several children. The train table size and dimension must also be appropriate for the toy train set you have. It will be a waste of money to buy a large table set having an expensive price if the train set or the train tracks consumes only half or 1/3 of the large table set. In some cases, there are tables that can also be used as an activity or learning table wherein a large scale train table could work just fine. Space can offer great comfort if your children are into arts and crafts. Bumping around delicate art materials that will cause spills and stains such as glue, watercolor, paint, etc. is less likely to happen if they have a huge space to move around. You need to check out the materials of a certain table product if it suits your desire or preference. An ideal train or activity table is made of hardwood as it is very strong and sturdy. But there are some table products that come affordable and is made of plastic at an expense of having a low durability or will easily break as the weight of the person leaning or the play-set being placed on top goes higher. The price only varies when you are having a tight budget or setting a line of how much money you’re going to spend on a table. If financial reasons are not of any issue, then it is all up to you to decide. Usually, the best train table is those that come at an expensive price but try to conduct research or do some canvassing as there are moderate priced train table and set products that could compete or comes close to an expensive set. What is a train table set? A standard train table set is usually composed of a battery-operated wooden toy train that runs through tracks while pulling its cars with the help of metal hooks, hidden magnets or plastic wheels placed on metal axles. To bring the table to life, the scenery could be created by placing cardboard buildings, trees, and roads. Adding manually-movable props such as cars or miniature people makes the table set even more interactive. Why should I buy a train table set? Some people think that the train table set is just a novelty display, picking up only the wooden toy train and maybe the train tracks if it’s on sale, but having a complete set in your home has its own benefits. Laying down the train, tracks and the scenery is already a fun activity for the whole household. Now imagine the adults having the luxury to sit down while they help build it with the children. Having the whole set on the table not only makes it comfortable, but it also prevents anyone from tripping and makes moving around easier once playtime is over. How do I pick the right train table set? Choosing the train table set that’s right for you is easy once you’ve noted down the two most important details. You need to know how much space you’re willing to spare in your house and the type of detail you want on your set. For someone who has already a set of train cars and accessories, the next thing would be finding the right train table set for it to settle. Now, there are lots of train tables you can choose from. Actually, there are countless train table products out there in the market. This guide will help you mark down the number of train tables to look for and narrow your search down with the top and best sellers. A proper train table set would cater all the necessary parts of your train set. It must be sturdy enough to carry the weight of your train set as well as the leaning weight of your child. In some cases, a table should also have at least a storage space built into it. You wouldn’t want your train parts and accessories scattered all over the room. A proper table should also fit the room or at least won’t consume a lot of space but offers your child a room for movement. It is important for your child to stay active physically and mentally. A nice room for movement would enhance that. This table is built to support different train sets that help young minds have a fun and interactive childhood. The table is made by one of the oldest manufacturers since 1884. Brio makes high-quality wooden toys which include trains and tables. Their designs are focused on quality, craftsmanship and a durable or long lasting toy, products that develop your child’s brain. They create toys that are both fun and educational. It has smooth corners. A table painted with multiple coats of lacquer paint that are non-toxic with a vibrant finish. There is a sidewall that helps hold the train set in place. The table comes with water and grassy land decals. The table is easy to assemble and disassemble. Good for ages 3 and up. It has a proportional height and width good to level with your child. The table has space underneath for a sitting child’s feet to stretch. It can also be used for other toy sets such as Lego, etc. For just a table, it comes a little expensive. There is no storage space built in it. No special features. Very simple. It is a very nice train table. Even if it is simple, it can hold up to any kind of play toys may it be a train or a Lego. The table supports whatever is on top of it well. It comes expensive but it’s totally worth your money. Durable and is sure to last long. PlanToys are one of the manufacturers that maintain a superior and strong quality of toy products. They promote a safe standard that follows an environmental path and social responsibility. Ethics are implied in the creation of their product. Their innovation is to the positive development of kid’s childhood. PlanToys Toy Play Table is an all-in stylish and contemporary design. It is a simple yet very strong table that could give your train sets the sturdiness they need. With the table being wide, your children together with their friends can enjoy playing around it. It is made of Rubber-wood. The table is very neat and wide. Good for multiple children playing around. It is good to hold every toy product which includes trains sets and accessories. It is a non-hazardous table. Contains no plastic. The table is very simple making it very easy to assemble. Very sturdy and can stand firm. Expensive for just a plain and sturdy table. The quality is very neat and you can’t complaint more about it. Regardless of the expensive price, the product is very strong, durable and could accommodate almost every child’s play toy or trains. 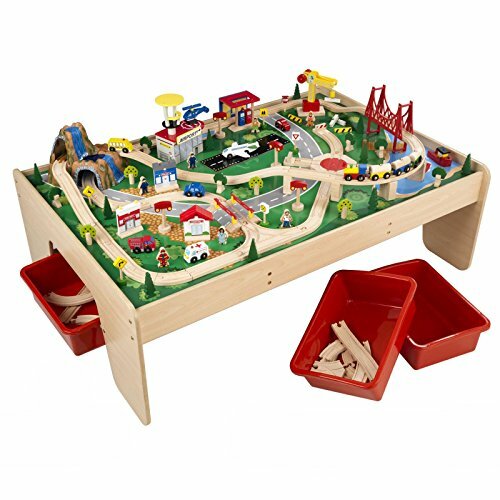 This play or train table is built to support mainly the Chuggington and Thomas Wooden Railway trains and tracks. This is more likely to be a pair or extension of the Chuggington and Thomas train sets. It is a kid-friendly table that could support other play toys or train sets. The table has an appropriate size well enough for your young engineers to play for hours joyfully. It is made out of real wood. Compatible with other train tracks systems. It includes a table and a board. The table is best used with different Chuggington and Thomas Wooden Railway sets. It has a nice space underneath the table, good for your storage bins. The set is included with table bumpers that are not included in the picture. The table top is made out of 2 pieces, making it a bit uneven on the other end. Beams of the table seem to support only one side of it. The table’s versatility is nice. It can support other train sets even thou it is built to be used best with their own train products. It can handle a heavyweight and is wide enough for your child’s bodily activities. The color of the table is also very stimulating and fun for your child. It fits the room nicely. The train set features Koko, a well-known character in the Chuggington train series. The set is perfectly compatible with most major brands of wooden train toys. 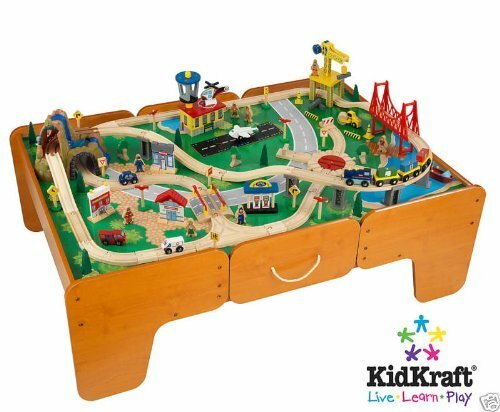 KidKraft is a company well known for creating toys, train sets, and tables. This table is generously wide providing your child a great playtime experience. The set is a kid-sized table that is strong and sturdy. The train set is not included. It has T-Model Edges. The design is to prevent chipping. The table’s edges are curvy. That is to provide safety for children in case of a fall or a bump. A sturdy constructed table that is easy to assemble. There are a reversible flip side play-board and silk-screened landscape. The table is versatile. It can accommodate many train sets and serves a different purpose. The table has a perfect height for children aging 3 and up. There is no need for screws. It has brackets to easily slide them over. The wide size is enough not to get in the way of your child moving around while playing. It is not well depicted. The table top is made of a compressed cardboard. A non-spill free material. A little bit expensive over other train table product. The product is very reasonable. It is strong and sturdy. The price is proper tforthe quality of the materials used in the product. With the simplicity of its wood tones, it is an excellent table for your train set, a nice table to grow your child’s memory. This is an all-purpose train table set that kids aging 3 and up could greatly enjoy. It is wide and large space area. The table can serve to be your child’s dollhouse, Lego set stand, puzzle table and can serve to be a working table for arts and crafts. It comes in with a table drawer for organizing and to cater your art materials, Lego sets, train sets and other recreational things. It acts as an activity table. The table is designed with a double-sided play board. There is a pull-out drawer for storage purposes. A quality yet affordable product. It is ideal for train sets, dollhouse, arts and craft, puzzles, block play and more. Compared with other table products, it is less expensive but with many purposes. The drawers are good for storing your coloring materials, train sets, puzzle sets, doll or Lego sets. A great play table for kids. It has many uses for giving your child many learning opportunities. The wood is not that thick, it is more likely to weaken at an earlier time. It’s not that sturdy compared with other wood tables. The price is very reasonable. For a farm more cheaper table, you might say that this would hold up most of your children’s needs. It’s inexpensive and serves many purposes. The wooden train table would also go along very nicely with a train set. I would recommend this for a child who gets bored quite fast with one type of toy.